The Love Wonder Bouquet bursts with the beauty and magic of love's finest moments. 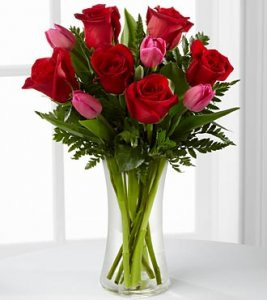 Brilliant red roses are brought together with fuchsia tulips and lush greens in a classic clear glass vase to create a bouquet rich in romance and sweet sentiments. Make her yours in a heartbeat! 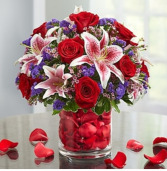 Our luxurious gathering of red roses, Stargazer lilies and more is handcrafted inside a glass cylinder vase filled with romantic rose petals to leave any Valentine speechless. And if you’re planning an intimate dinner for two, it’s the perfect centerpiece to help set the mood. (Hint, hint!) Presented by Bloomnet. Make her yours in a heartbeat! 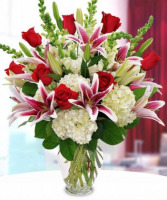 Our luxurious handcrafted arrangement of red roses and Stargazer lilies was designed to wow your Valentine, beautifully displayed inside a glass cylinder vase lined with a Ti leaf ribbon.